I imagine my travels and penchant for the punch has led me to taste more than 300 different beers to date, and Little Creatues is now in my Top 5. How’s that for a statement? This pale ale was overtly floral to the nose but not so to the taste, and reminded me a bit of another Top 5, 3 Floyd’s Gumball Head. It had a mild, hoppy finish, making it a very drinkable session brew. It was just my luck that after tasting Little Creatures for the first time I found an outpost of the South Australian brewpub in the Melbourne neighborhood of Fitzroy. 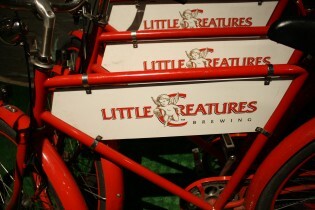 At the front, patrons are invited to take Little Creatures bikes to stroll down bohemian Fitzroy St. or to run errands in an effort to help reduce carbon emissions. Inside there is a library/reading room where visitors are welcome to sample literary classics while you imbibe. Also, guests are able to browse the web using the bar’s very rare free Wi-Fi. 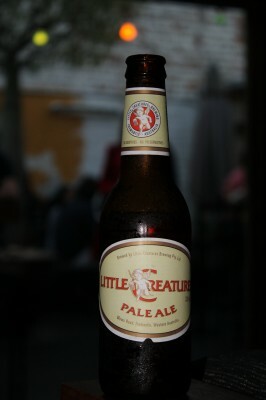 The brewpub also allows you to send Little Creatures postcards anywhere in the world postage-free. While there I gave the White Rabbit Ale a try and this also impressed me. It’s a bit sweeter in taste and a bit higher in alcohol content, much like a Belgian Trappist ale. I’m excited to give their Bright Ale a go next time I’m in the neighborhood. Listed in the bar are “Other beers we love” by the LC staff. Sierra Nevada’s Pale Ale acted as the lone brewing ambassador from the States, and a bottle and taste of home could be had for a whopping $12. I declined.